I received products for review from BBUSA brands. The opinions within this post are of my own and I was not influenced in any way. Please do your own research before purchasing products or using services. Your opinions and results may differ. I have two teen boys in my house. As any mother can relate, teen boys seem to be hungry. All. The. Time! I know what it's like when a teen is "hangry". To avoid those situations, I keep my pantry stocked with snacks the kids can munch on throughout the day. I have to do the same with my mother. Her eating situation is one where she will graze rather than eat big, and she is no different than the teens. 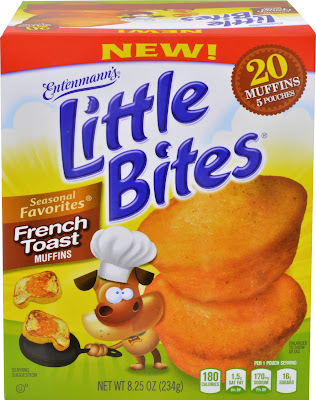 Entenmann's Little Bites Muffins are a hit at my house, and I'm excited that the company has introduced a new flavor to their seasonal line - Little Bites Cinnamon French Toast Muffins. These golden baked snacks are made with a hint of cinnamon and infused with maple syrup. I received two boxes of Entenmann's Little Bites Cinnamon French Toast Muffins and they were gone in just a couple of days. There are five pouches per box, with each one having four muffins in them. Perfectly portioned, they were quite delicious and tasted fresh. Although we enjoyed them straight out of the package, the muffins can be heated in the microwave for seven short seconds. This seasonal variety was a hit, and I'll definitely be purchasing some before they're gone. Not only do they make a tasty snack for mom and the boys, they're great for me to take to work and eat during the midnight shift. 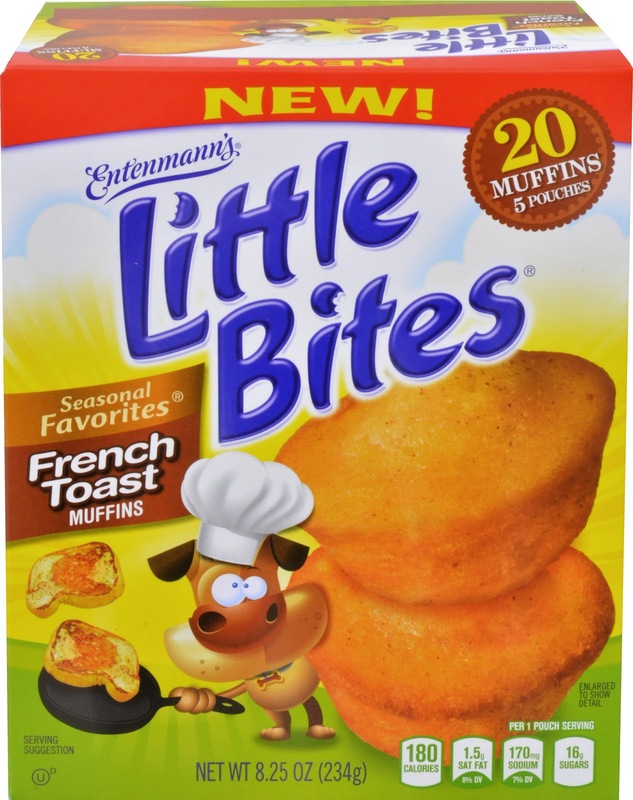 Entenmann's Little Bites contain 0g trans fat, no high fructose corn syrup, and are 200 calories or less per pouch. The Cinnamon French Toast Muffins variety are available now until May 2016. Be sure to get some before they're gone! Maureen Sticco from Entenmann's bakery has shared fun and tasty DIY's using the new Muffins that the whole family will love. Check out the video for Little Bites French Toast Breakfast Sliders, made with wholesome yogurt and fruit, here. For more recipe ideas using Entenmann's Little Bites, be sure to visit the Little Bites Facebook page. I'd like to try Snickerdoodle Pop'Ems. I would enjoy the Butter Sunshine Bundt Cake. I would like to try these sprinkled doughnuts. Yum! These sound delicious! I'd also like to try the Little Bites Chocolate Chip Muffins. I want to try the Frosted Pop'ems. I would like to try their little bites chocolate chip muffins and crumb coffee donuts. Oh I would love to try the Mini Cakes-Crumb Cake! I would love to try their Bavarian Creme Coffee Cake. They have great products. I would like to try the Crumb Cake Little Bites. I would like to try the Chewy Chocolate Chip Cereal Bars. Yum! The crumb topped donuts. I would like to try their french cheesecake. I bet it would be really good. I would like to try the mini crumb cakes. I would like to try Lemon Crunch Cake. i want these Delicious, golden mini cakes with rainbow sprinkles! The perfect way to celebrate snack time! I would like to try the Little Bites Blueberry Muffin. I would like to try the Little Bites Banana Muffins. I would like to try the Cheese Danish Twist. I would love to try the Lemon Crunch Cake! Sounds pretty good! Snickerdoodles are my favorite cookies, so I'd love to try Entenmann's Little Bites Snickerdoodle flavor! 8 Chocolate Lovers Variety Pack Doughnuts would be what I want to try. I would like to try the Marshmallow Devil's Food Iced Cake. I like their mini muffins and their donuts for a quick breakfast. I would like to try their crumb cake, but it isn't sold in my region. I'd love to try the Individually Wrapped Blueberry Muffins for my kiddos! Seems like a great grab & go breakfast! I'd like to try the Cherry Cheese Danish! Little Bites Apple Cinnamon Muffins sound so good love to try them. I'd like to try the Chocolate Fudge Cake. The snickerdoodle pop 'em look delicious and I cant wait to try these but do many others also look so good! Yum! tHE LITTLE brownie bites are really good! I would love some Entenmann's Lemon Crunch Cake right now! I love anything Entenmann's, actually! I would love to try the cherry cheese danish...it sounds heavenly! I'd like to try their Little Bites Chocolate Chip Muffins or Party Cakes. I would love to try the crumb donuts! I would love to try the little bites banana muffins. The Banana Loaf Cake is my choice. The lemon crunch cake sounds good! I would love to try the crumb coffee cake! I'd like to try the Apple Cinnamon. I haven't tried their cookies yet. I would like to try their chocolate-covered donuts! I would like to try their Deluxe French Cheese Cake. I have never seen it in the store?!?! I like the chocolate chip muffins. I would like to try Entenmann's Lemon Crunch Cake. I would like to try their Little Bites Chocolate Chip Muffins. I really want to try the Crumb Donuts! They sound delicious! I'd love to try a box of Little Bites Chocolate Chip Muffins. I love the Frosted Devil's Food Donuts. I would love to try the Little Brownie Bites. It sounds very tasty.